When and where do I file my qualifying papers? What if qualifying papers are filed with errors or ommissions? After filing, may I later change the way my name is to appear on the ballot? What are the amounts of the qualifying fees for county offices? May I get my qualifying fee back if I decide not to run? May I have my name placed on the ballot with no party affiliation? No qualifying papers will be accepted after the 12:00 Noon deadline. Appointment of Campaign Treasurer and Designation of Campaign Depository Form DS-DE 9 * (However, you may have already filed this form with the Supervisor of Elections). * Excluding Special District candidates who do not intend to collect or expend campaign funds. An Affidavit of Intention must be submitted if a Special District Candidate chooses this option. Pursuant to 99.061(7), Florida Statutes, if the filing officer receives qualifying papers that do not include all items required, the filing officer shall make a reasonable effort to notify the candidate of the missing or incomplete items and shall inform the candidate that all required items must be received by the close of qualifying. After filing as a candidate, may I later change the way my name is to appear on the ballot? Pursuant to 99.061(7)(b), Florida Statutes, a candidate's name as it is to appear on the ballot may not be changed after the end of qualifying. Partisan candidates pay 6% of the annual salary of the office sought (99.092, Florida Statutes). The 1.0% election assessment is deposited into the Elections Commission Trust Fund. The annual salaries used to determine qualifying fees are from July 1st immediately proceeding the first day of qualifying. Yes, 99.092(1), Florida Statutes, provides for reimbursement for the qualifying fee provided that you withdraw your candidacy before the qualifying period ends. Pursuant to 99.095, Florida Statutes, a person seeking to qualify for nomination to any office may qualify to have their name placed on the ballot for the primary by means of the petitioning process. There is a $0.10 verification fee per petition submitted. However, NO petition may be circulated prior to filing the Appointment of Campaign Treasurer and Designation of Campaign Depository (Form DS-DE 9)! Any petition signed prior to the filing of said form will not be accepted. A copy of the petition may be obtained from the Division of Elections website. The candidate is responsible for reproduction of the petition Form DS-DE 104. 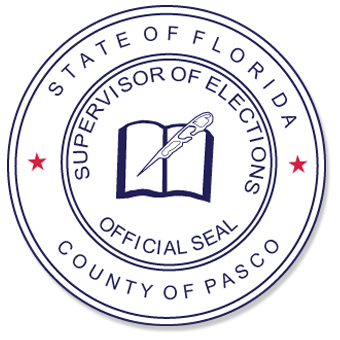 You must obtain valid signatures equal to at least one percent (1%) of the total number of Pasco County registered voters. (The registration statistics used in computing the requisite number of signatures are those for the 2018 General Election). Special District candidates need 25 valid signatures to qualify by petition method. If you are qualifying by the petition process, the number of valid signatures you must secure is 3,519. The Supervisor of Elections will notify you, in writing, whether the required number of signatures has been obtained prior to the first day of qualifying. The Supervisor of Elections will retain a copy of your certification as part of your qualifying requirements. You will not be required to pay the qualifying fee or party assessment and will be entitled to have your name printed on the ballot. Additionally, you may file an Undue Burden Oath with the Supervisor of Elections exempting you from paying the ten cents ($.10) per name checked. This oath must be filed with the Supervisor of Elections at the time petitions are submitted for verification. The form used will be the Affidavit of Undue Burden. Note: If the candidate is running for an office which will be grouped on the ballot with two or more similar offices to be filled at the same election and the petition does not indicate the group or district office for which they are running, the signatures obtained on the petition will not be counted. Yes, the Florida Statutes provide in Chapter 99.0955(1), that any registered elector may have their name placed on the general election ballot as a candidate with no party affiliation. You shall file qualification papers and pay the qualifying fee or qualify by the petition process during the times and under the circumstances prescribed in 99.061, Florida Statutes.